Physicists Solve The Mystery Of Levitation – Hello Hoverboards | OhGizmo! 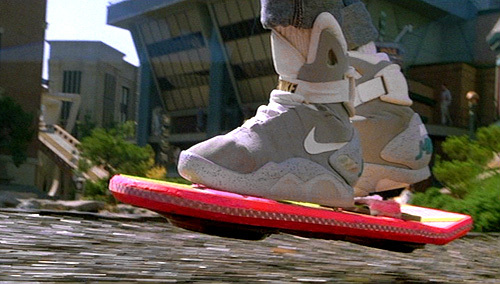 When Back To The Future II came out a lot of people were convinced that the hoverboards seen in the movie actually existed but were too dangerous to sell to the public. Of course if you look closely you can easily see the wires that were used to create the hovering effect but a couple of scientists from the University of St Andrews in Scotland may have finally found a way to make hoverboards a reality. Professor Ulf Leonhardt and Dr Thomas Philbin believe they’ve discovered a way to reverse the Casimir force which is a result of quantum mechanics and is what basically causes objects to stick together. Using a sort of special lens (I’m sure that’s a very dumbed-down description of the actual device) the scientists believe they can re-engineer the Casimir force so that it repels instead of attracting. Unfortunately though it seems the Casimir force and this breakthrough only apply to the nano-particle world for now, which means that hoverboards are still a ways off but in the near future it could allow for the development of nano machines that run smoother with little to no friction making them more energy efficient. This would be the invention of the century would it become a reality!! !